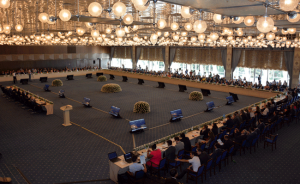 The annual WCO PICARD Conference took place in Baku, Azerbaijan from 8 to 10 September 2015, giving rise to stimulating interdisciplinary debates around the following main themes: global value chains (GVCs); taxation and other revenue matters; and smuggling. 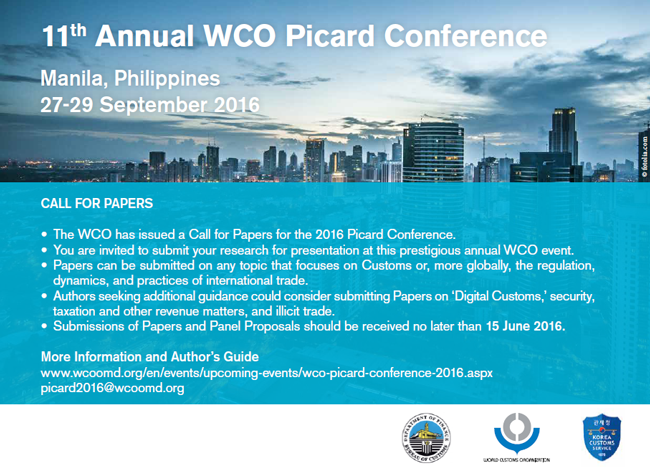 Following the issuance of a Call for Papers (CFP), over 65 submissions were received for consideration – a new record for the Conference. The Conference Scientific Board ultimately selected approximately 25 papers for presentation by Customs professionals and academics from disciplines such as anthropology, criminology, economics, law, and political science. Since 2006, the ‘Partnership In Customs Academic Research and Development’ (PICARD) has contributed actively to the dynamic exchange of views between Customs administrations, universities, and research institutes on topics relevant to Customs and international trade, which can constructively feed decision-making processes. Some 240 participants from over 50 countries, representing Customs administrations, the academic and research communities, and international and regional organizations, as well as the private sector, attended this three-day event. It offered a unique opportunity for networking, and for exchanging views on very specific topics. Chaired by Robert Ireland, the WCO’s Head of Research and Communications, and hosted by the State Customs Committee of Azerbaijan, this 10th edition of the PICARD Conference officially kicked-off with opening addresses by the Secretary General of the WCO, Kunio Mikuriya, the Chairman of the State Customs Committee of Azerbaijan, Aydin Aliyev, the Deputy Prime Minister of Azerbaijan, H.E. Abid Sharifov, and Vice-Commissioner Donh-Hyun Lee from the Korea Customs Service (KCS). During the Conference, keynote addresses were delivered by three Nobel Laureate economists, Dr Eric Maskin, Professor at Harvard University (United States), Dr Edward Prescott, Professor at Arizona State University (United States), and Dr Finn Kydland, Professor at the University of California in Santa Barbara (United States). The political economist Dr Mick Moore, Chief Executive Officer of the International Centre for Tax and Development in the United Kingdom, also delivered a keynote address by setting the overall scene for the topics to be discussed during the Conference. He compared the evolution of tariffs and corporate taxes linked to their determinants within the increasingly globalized international trade framework that exists. While massive international trade expansion has been witnessed during the last decade, corporate taxes collected from Transnational Corporations (TNCs) did not follow the same positive trend. Increased support to value-added tax (VAT), trade facilitation and GVC by authoritative bodies, such as the World Trade Organization (WTO), impacted positively on trade expansion on the one hand, while increased tax avoidance by TNCs and the multiplication of tax havens hindered tax collection, on the other. In this context, Dr Moore underlined the wide scope given to possible transfer mispricing as well as the disadvantages that many developing countries face due to the weaker organizational capabilities of their tax administrations, which depend heavily on corporate income taxes (CIT). To address this situation, he suggested that Customs should work hand-in-hand with national tax bodies to collect information from TNCs, and compare the data. Also on the agenda were presentations made by representatives of journals that publish papers on Customs and border issues, including the Global Trade and Customs Journal, the Journal of Borderlands Studies, and the World Customs Journal, as well as the International Network of Customs Universities (INCU). In the spirit of looking to the future, a Youth Forum brought together some 70 students from various universities to discuss topics raised during the Conference, as well as future career possibilities in Customs and in the international trade arena. Panellists: Siv Rebekka Runhovde, Norwegian Police University College; Minette Libom, Director General, Cameroon Customs; and M.R. Rajmohan, Sri Lanka Customs. Within a Customs administration, incentivization systems are often developed to encourage officials in their daily work. Based on concrete examples, various incentivization methods in place in Customs administrations around the world, such as in Cameroon, Norway and Sri Lanka, were analysed. These methods can take the form of financial and non-financial rewards, but some possible shortcomings were also pointed out. In Norway, seizures of products protected under the Convention on International Trade in Endangered Wild Fauna and Flora (CITES) were highlighted as occurring too often by chance, given that they are frequently not among the targets embedded in risk management systems used by Customs officers, often due to these seizures not being accorded as high a priority as other seizures, such as narcotics. Therefore, the support or non-support by Customs officers to the implementation of existing legislation, addressing the illegal wildlife trade for example, can depend directly on the incentivization method in place, which itself is dependent on organizational strategies and policies. Panellists: Antoine Vion, Aix-Marseille University (France); Gaëlle Balineau, Agence Française de Développement (France); Nicholas Humphries, Australian Customs; and Dylan Geraets, Leuven Centre for Global Governance Studies (Belgium). The globalized economy leads to the increased fragmentation of production processes at the international level and the circulation of intermediary goods. GVCs are, therefore, of major interest to Customs professionals, who work at borders. During this session, it was explained how the requirements for specific sustainable development-related standard-setting systems for some consumer products were shown as having some impact on GVCs. GVCs and their direct implications for Customs were also analysed, with data showing the existence of correlations between GVCs and trade facilitation, and GVCs and revenue collection. Interestingly, suggestions were also provided on how best, through revised government strategy and economic policies, a country could increase its participation in GVCs. Delegates were advised that, given the multidimensional nature of GVCs, the best approach should remain multifaceted to be successful: it should not only imply trade facilitation reforms with unilateral and multilateral liberalization of tariff and non-tariff barriers, but also the implementation of policies that would promote skills development, and ensure innovation and strategic infrastructure. Finally, GVCs were also analysed in relation to the application of rules of origin (RoO) systems currently in place. Given that GVCs have drastically altered the international trade environment and that the complexity of RoO systems sometimes causes companies to forego preferential tariff treatment, it was suggested that using a more value-added approach would better suit modern business realities. International trade is in constant evolution and innovations are crucial to Customs, which needs to adapt to keep up with the latest trends. This topic was looked at from systemic, strategic and sectoral perspectives. First, the necessary ingredients that make a dynamic project successful were analysed, revealing that besides new ideas which are necessary, attention to risk mitigation, careful management, and employees’ competencies should not be neglected in the process. Second, information technology (IT) systems currently being developed at national level to ensure global interstate information-sharing between Customs, in a context of progressive, enhanced economic integration, were explained. The last presentation looked at the cross-border trade situation of electronic goods, underlined as being strategic by nature, and concluded that there was an urgent need to unify the rules governing this sector within a globalized trade environment to ensure higher predictability for business activities. Panellists: Theo Colesky, South African Revenue Service; Juha Hintsa, Cross-Border Research Association (Switzerland); and Robert Luessi, Swiss Customs. Customs deals with tariff classification on a daily basis, which is very technical but crucial to revenue collection. As a result, the first presentation looked at the provisions and practices governing dispute resolution on tariff classification matters, comparing the systems in place in South Africa with the ones in Australia and Canada. This presentation concluded that their highly technical nature requires either an independent and specialized court to be established, or the mandate of current tax courts to be extended to ensure more accurate tariff classification, thereby contributing to trade facilitation. Indeed, this would also lead to reduced litigation costs and time, and ensure higher transparency. The second presentation shared with the audience some results of a survey on the advantages and possible development of a global Customs revenue collection benchmarking database for sharing information on tax revenue streams and tax collection costs among Customs administrations. Finally, given that Customs deals with revenue collection, the economy, security and migration, and health and environment issues that involve other administrations, the benefits of a shared database between agencies for enhanced exchange of information were shared during the last intervention under this session. Such cooperation is leading, in particular, to IT cost reduction, increased transparency, and improved legal certainty. Panellists: Cristina Mitaritonna, CEPII (France); Cyril Chalendard, CERDI (France); Lofti Ayadi, Researcher (Tunisia); Rong Hu, Shanghai Customs College (China); and Shintaro Hamanaka, Asian Development Bank. Goods moving around the world lead to high volumes of data exchange, which can lead to hiccups and the need for stricter management at borders. Issues concerning Customs duty evasion were raised in relation to tariff receipts, which can only be addressed by a wide range of reforms. However, the positive impact of the adoption of automated Customs data treatment solutions and, in some cases, pre-shipment inspections were explained. Typologies of some fraud risks were also analysed in relation to the way stores and Customs clearance areas are managed and handled, and how they could be addressed through risk management and other policies, with Tunisia being used as an example. To respond to issues coming from e-business development, China Customs was reported as having adopted a new anti-smuggling approach, using some integrated supply chain companies that are said to address not only traders’ needs, but also the needs of governments. Finally, more globally, the availability in a country of quality trade statistics was demonstrated as being a possible good indicator of trade governance. Conflict zones seem to favour the trafficking in cultural goods, so anti-smuggling strategies are urgently needed to protect cultural heritage in these zones. Possible approaches on how best to address this form of trafficking by criminal groups focusing on countries in conflict, and how best to protect cultural property as part of the security policy of the European Union (EU) were discussed. Levels of protection should be adjusted following the trafficking patterns and the situation of a given country. The analysis of data coming from seizures in the framework of the illicit trade in cultural property and archeological/ethnological objects by the United States’ Immigration and Customs Enforcement (ICE) agency showed the existence of many loopholes in the way seizures are currently reported, leading to difficulties in having a clear overview of the phenomenon of cultural heritage trafficking. The use of standardized software could help improve the situation in this specific field. Panellists: Yulia Mazanik, State Customs Committee of the Republic of Belarus; and Oleg Komarov, State Fiscal Service of Ukraine. In a globalized economy, risk management is a core tool used by Customs, when controlling goods at the border. Two pertinent examples were demonstrated during the session: in Belarus, how automated Customs risk management systems can support Customs officers in their valuation control work, and in the direct calculation of Customs duties and taxes; and in Ukraine, the advantages reaped through the use of automated systems in the field of enforcement. Panellists: Sami Bensassi, Birmingham Business School (United Kingdom); Vanessa van den Boogard, University of Toronto (Canada); and Cyril Roussel, French Institute of the Middle East (France). For revenue collection and tax revenue purposes, looking at the potential existence of informal trade in a region is highly relevant to Customs. Typologies of the informal trade taking place at the borders between Algeria and the northern part of Mali, and between Iran, Iraq and Turkey, as well as in Sierra Leone, were described in detail during this last session, including the impact on their respective local economies. Attention was also drawn to the importance of taking into account some of the specific characteristics of these informal cross-border trade practices, when examining Customs and tax reforms. The 2015 PICARD Conference made great strides in strengthening an interdisciplinary approach to better understanding international trade, borders, and Customs matters. Christine Msemburi, the Director of the WCO Regional Office for Capacity Building in East and Southern Africa, closed Day 2 of the Conference by advocating the need for more research to ensure that Customs and border realities are properly told and understood. “Let’s tell our stories,” she said.